I would like to take this opportunity to thank everyone who contributed towards the study. 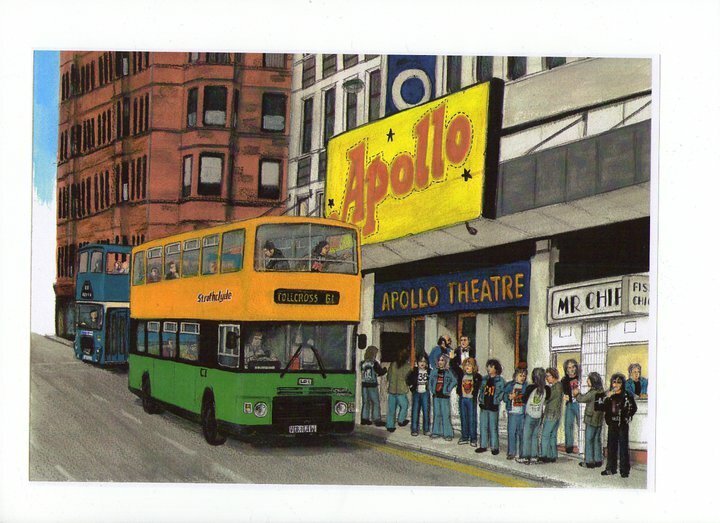 As can be imagined, with a venue like the Apollo being the focus, the research topic proved most popular. Contributions were received from all over the globe, with replies originating from Springburn to Singapore. Several of you were kind enough to answer questionnaires about your Apollo memories, whilst others attended one of the research focus groups or were interviewed individually. Many of you brought along, or sent me, collections of ticket stubs or other examples of venue memorabilia, for which I am extremely grateful. Suffice to say, the thesis could not have been completed without your input, with many of these reminiscences and items possessing a ‘wow’ factor that added great value to the study. Unfortunately, space restraints meant that I was unable to include all the contributions on this occasion, but please rest assured that the essence of all the memories are encapsulated within the study. I’m also in the position of preparing addition material for what I hope will be a book project on the Apollo, so more contributions will be hopefully be featured at a later stage. Given the widespread support from all the interviewees, it is difficult to highlight individuals, but I would like to express my appreciation to Colin Robertson, the first Manager at the venue, for his time, assistance and enthusiasm. As the person who started the Apollo, Frank Lynch was good enough to allocate time from a busy schedule at short notice, and proved to be an engaging interviewee. Jan Tomasik, Eddie Tobin, Gerry Tait, Russell Gilchrist, Russell Kyle, Billy Sloan, Danny Hendry and Sam Shrouder, were all particularly helpful and forthcoming – thank you all. Similarly, I am also indebted to Russell Leadbetter, Scott McArthur and Martin Kielty, who not only provided the framework for the venue history through their Apollo-related ventures, but also gave valuable assistance towards the study. Other interviewees like Maggie Duncan, Trish Ordish, Jim Sharp, George McCracken and Karen Cheyne, all deserve special mentions. I would also like to offer a special thank you to all of the artists who provided valuable insights about their Apollo experiences. These include, Rick Wakeman, Elkie Brooks, Dave Bartram, Barbara Dickson, Graham Gouldman, Richard Jobson, Steve Hackett and Ray Jackson.